Purple Crane is fully qualified to provide affordable, full-service crane lifting for the removal, moving, and installation of machinery. Our family-owned business has three decades of experience lifting all kinds of machinery for contractors across Southern California. Our experienced, CCO-certified crane operators are punctual, accurate, and safe, and they get the job done right the first time, every time. 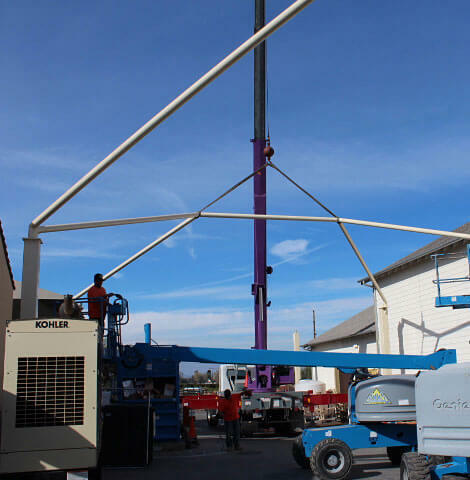 They're experts at operating our state-of-the-art cranes, which range in capacity from 3-ton to 75-ton. Our 75-ton crane can reach as high as 12 stories, or 165 feet; we can even lift machinery over buildings when necessary. Purple Crane can handle all your machinery lifting and transportation needs, from start to finish. We can lift any piece of large-scale equipment or machinery, including manufacturing machinery, medical equipment and machinery, printing presses, large appliances, and any other type of machinery or equipment. If you're moving equipment to a new location, we can help you remove it with a crane at the old site; transport it using our heavy-duty trucks and trailers; and lift it for installation with another crane at the new site. We can provide transportation to any location in Southern California, whether your machinery needs to go to a new job site or the scrapyard. We offer the best value in crane rental for machinery and equipment: not only do we offer competitive rates, but we also provide high quality, reliable service. We guarantee that we will determine the correct crane for your project, and that our crane and operator will arrive at your job site on time. Our accuracy and efficiency will help keep your project on time, on budget, and on track. Call us today to learn more about our machinery lifting services and affordable rates. A live person is standing by to answer your call 24 hours a day, 7 days a week. Our crane services are also available 24/7. Purple Crane is an OSHA-compliant company, and we're fully insured, with same-day insurance certificates available upon request.